The life of our Lord Christ, Light of the entire world, would indeed be the shining source of amazement to whoever embarks on visiting the sacred sites in “Philistine”, to witness engraved upon each and every church and monastery what bears witness to the divine life of Jesus Christ the Lord, from the Annunciation of the Angel to Saint Mary in Nazareth, right through to the ultimate scene of His Ascension into the heavens at the Mount of Olives near Bethany, all-in-all testifying to His Baptism, Ministry, then His entrance into Jerusalem, His arrest, Crucifixion, burial and Resurrection; therefore the visitor could indeed envision the very steps of the Lord and follow in their prints, as if reading one Gospel magnified through those sacred monuments! 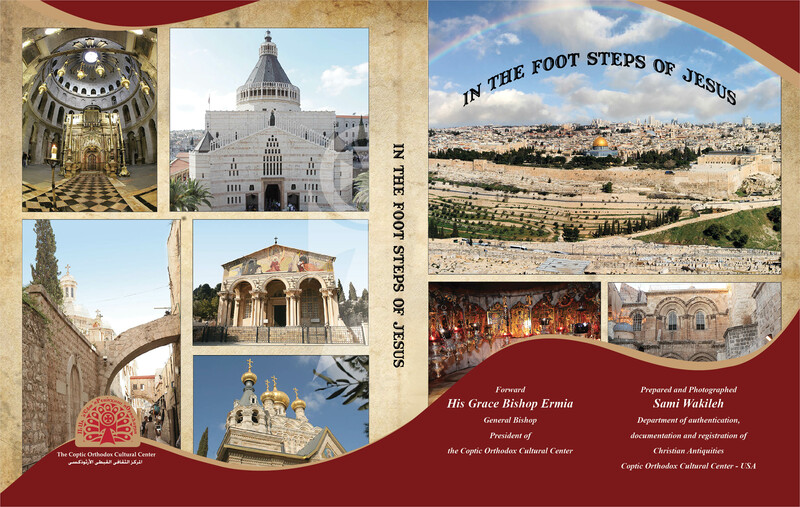 STEPS OF THE LORD CHRIST is a book dedicated to documenting the awe-inspiring journey of the Lord Christ on earth, illustrated in captivating pictures to usher us from one place to some other, while we are aspiring to tread the selfsame road that was blessed by every footprint of our Lord. Pause to ponder what directs us into roads, one after the other throughout history, towards the era that witnessed and was blessed by the life of our Good Savior: here is the city of Nazareth, presenting to us the scene of the Annunciation delivered by Archangel Gabriel to the Virgin of Nazareth; where his words would echo into our attentive ears: “Then the angel said to her, “Do not be afraid, Mary, for you have found favor with God. And behold, you will conceive in your womb and bring forth a Son, and shall call His name Jesus. He will be great, and will be called the Son of the Highest.” [Luke 1:30-32], then to Bethlehem where the sacred Nativity took place; the manger to which the Magi hastened, moving our innermost hearts to recite celestial chants: “Glory to God in the highest, And on earth peace, goodwill toward men!” [Luke2:14], then again before the River Jordan, where emerge the minute details of the Divine Materialization at the Baptism of the Lord Christ at the hands of the prophet of both Testaments John the Baptist, greatest among those born of women, when, “Suddenly a voice came from heaven, saying, “This is My beloved Son, in whom I am well pleased.” [Matthew 3:17]. Now in front of the Mount of Temptation, where all are keen to recall the words of the Lord Christ heralding: “It is written, ‘Man shall not live by bread alone, but by every word that proceeds from the mouth of God.’” [Matthew 4:4] urging your heart to plead for support from He Who was tempted for our sake, to teach us the way to victory. Plain to your sight inside the Church of the Beatification, is the precise scene of our Good Master delivering His Sermon on the Mount; that is rightly considered the constitution of our lives. Altogether, pictures contained in this book leave us aspiring to travel the distance to Jericho, commanding our attention to explore the acquaintance between the Lord Christ and Zaccheus, while Tiberias leaves us given to the memory of our Glorious Lord calming down the storm, and persuading Peter to dare walk on the waters in order to reach Him. We at last arrive at Jerusalem’s Church of the Resurrection, where reverence and veneration are hovering still all over its quarters that witnessed the ultimate narratives ever to be recorded upon history, wherein in its confines, word of our salvation was announced to humanity by way of the Crucifixion, Death and Resurrection of our Lord Christ Jesus, so you can’t help but chant in earnest: “O’ Lord, to You is the power, glory and majesty, for ever. Amen!” Then you find yourself craving to follow “the Marys” to the cemetery on Easter Sunday; listening to the voice of the angel pronouncing Him: “He is not here, but is risen!” [Luke 24:6]. Meriting our gratitude is Sami Wakeila; through the lens of a truly artistic cameraman, affording an honest endless effort to produce a set of pictures of distinct clarity, together presented with invaluable information, all in full display in an exceptional book that you are holding in your hands, within which our cameraman cares to pilot us towards the exact same steps of our Lord Christ throughout a journey with no parallel. Of the Lord, we ask the granting of His blessings to this book, rendering it a source of inspiration to whoever cares to read and/or thumb through its pages, in the name of Our Lady Saint Mary Mother of the Lord, and our pious Masters the Fathers Apostles, one and all, and by way of the prayers of His Holiness Pope Tawadros II, Pope of Alexandria and Patriarch of the See of Saint Mark. Twenty Ninth of Baramat 1732 A.M. Seventh of April 2016 C.E.